To clear up some common radiation treatment myths, I spoke with Dr. Michael Nichols, a board-certified radiation oncologist. Dr. Nichols sets the record straight about radiation treatment and how it affects your health. Myth 1: Radiation from a screening mammogram can give you breast cancer. Answer: The radiation received from a screening mammogram is relatively low. Think about what causes a greater risk to your health: having a mammogram, or not detecting a tumor early. Clearly the risk is higher if you skip screening mammograms. Research shows that the risk of dying from breast cancer is about 30% lower for women who have screening mammograms. Remember that your lifetime risk of developing breast cancer is approximately 1 in 8 or 9. The chance of getting breast cancer from a mammogram is tiny. Myth 2: Radiation is supposed to prevent a recurrence, but I think it will cause more breast cancer. Answer: In considering all women with early stage breast cancer, the risk of recurrence after surgery alone is approximately 40%. With whole breast radiation, that risk drops to around 15%. The risk of a second cancer from the radiation is about one in a thousand to one in ten thousand. In fact, because of improved techniques, the actual number of new cancers caused by radiation may be even lower. Myth 3: During radiation therapy, you have to take a pill and be covered with lead sheets for protection. Answer: Medical radiation therapy may be done several ways. Only for specific types of thyroid cancers do you take a pill. In most scenarios, you lay on a treatment table and the radiation is given much in the way that you'd get an X-ray. You won't feel the radiation and it is not painful. No lead shielding is used because the radiation is focused, and the small amount of scatter would not be blocked by a lead sheet. Answer: On a daily basis, the radiation treatments themselves are never painful. In a few cases, you might have some discomfort or pain related to the positioning because usually you must have your arm raised over your head, as it would be for a breast exam. As treatment progresses, you might develop redness and warmth of the skin. Occasionally your skin will develop a sunburn, which can be painful. Your radiation oncologist will help you with skin care and pain medications if needed. The important thing to remember is that your skin will heal. Myth 5: Radiation therapy causes horrible side effects. Answer: Radiation to the breast does not cause vomiting or hair loss (other than underarm hair or other hair that may be within the direct radiation field). Patients having radiation for other cancers, such as stomach cancer or pancreatic cancer, may develop nausea and vomiting. Patients receiving radiation to the head (for example, to treat brain cancer) may lose their hair. To get the truth about some common radiation treatment myths, I spoke with Dr. Michael Nichols, a board-certified radiation oncologist. 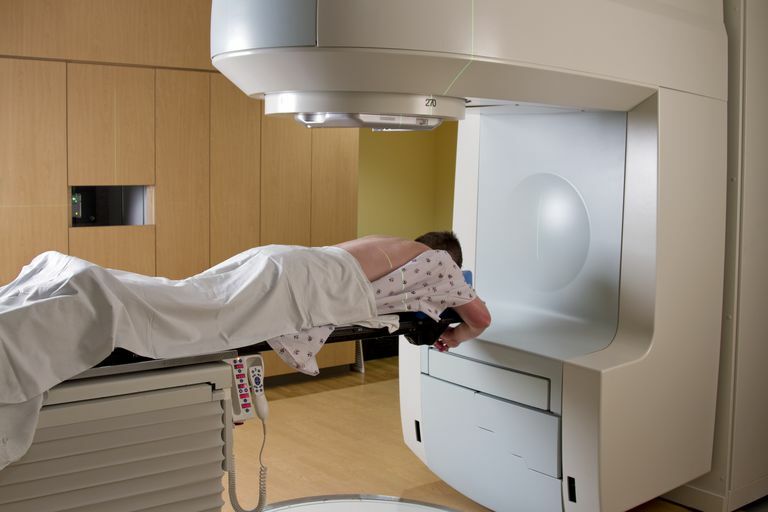 Dr. Nichols sets the record straight about radiation treatment and how it affects your health. Myth 6: My friend got burned by radiation therapy and lost her breast. Radiation is not safe or precise. Answer: Occasionally patients will develop a sunburn-type reaction. Although painful at the time, this almost always heals rapidly. It would be extremely rare for this to result in the loss of a breast. Radiation planning is precise and carefully performed by the radiation oncologist. Most cases are discussed with other physicians before starting treatment and shortly after treatment begins for quality control. Myth 7: We're getting radiation all the time -- from TVs, cell phones, wireless networks, electromagnetic fields, microwave ovens -- so that's why cancer rates are on the rise. Answer: We are getting radiation all the time, mostly from cosmic radiation from outer space. The level of exposure greatly increases when people are flying in an airplane or exposing themselves to the sun while sunbathing. The incidence of some cancers is rising. For example, the number of lung cancers has been rising since 1965 but has somewhat leveled off in recent years. The numbers in men seems to be declining while women seem to have reached a plateau. This closely parallels trends in smoking but may also have something to do with improved technology allowing us to detect the cancers at a smaller size. Breast cancers had remained steady for many years but have been decreasing since 1995 possibly due to a decrease in the use of HRT (hormone replacement therapy). The rates of cancers rising and falling can be difficult to interpret because it is often a complex interplay of the presence of the cancer versus our ability to detect the cancer. Myth 8: Medical radiation can be overdone or badly aimed, and when that happens, you die a slow and painful death. Answer: As with any medical procedure, there can be mistakes. Radiation is a wonderful tool that saves countless lives, but it can also harm patients if not delivered safely. Although there has been some recent media attention related to radiation errors, in general this is a rare event. There are numerous, frequent quality control checks -- including simulations -- performed before each treatment. In addition, the treatment machines are designed to shut down if there is a problem with it. Radiation mistakes often gain media attention and that makes them seem common. But tens of thousands of radiation treatments take place in the United States daily, the vast majority without error. Myth 9: If I have radiation treatments for breast cancer, my genes will mutate and affect my future children. Answer: Pregnant women should not have radiation. Otherwise, there is no evidence that whole breast radiation for premenopausal women will cause problems later with pregnancy or cause birth defects. Some data suggests that women treated for early stage breast cancer who became pregnant afterward had an improved chance of survival. If you are being treated for breast cancer and considering having children, you should discuss this with your doctor. In addition to radiation, there are also chemotherapy and hormonal treatments that can affect your future fertility. 10. If I get too much radiation, I will turn into SpiderWoman, the Hulk Lady, or I will glow in the dark. Answer: The amount of radiation given to women for breast cancer is relatively safe. In most cases, it is enough to eradicate the tumor while allowing the normal breast tissue to heal. At no time will you be radioactive. To my knowledge, no one has ever turned into a superhero following radiation. Michael A. Nichols, MD, PhD is a board-certified radiation oncologist practicing in Wilmington, North Carolina with Coastal Carolina Radiation Oncology. He earned his Ph.D. studying the molecular biology of cancer at the University of North Carolina at Chapel Hill in 1999. In 2003 he graduated from the Wake Forest University School of Medicine where he earned his M.D. He completed his residency training at the University of Chicago in Radiation Oncology in 2008. Personal correspondence with Dr. Michael A. Nichols, 2-26-2010. Twenty-Year Follow-Up of a Randomized Trial Comparing Total Mastectomy, Lumpectomy, And Lumpectomy Plus Irradiation for the Treatment of Invasive Breast Cancer. Fisher et al., New England Journal of Medicine. 2002. 347:1233. Second solid cancers after radiotherapy for breast cancer in SEER cancer registries. Berrington de Gonzalez A. et al., Br J Cancer. 2010 Jan 5;102(1):220-6.